This paper estimates the sensitivity of entrepreneurial investment to the cost of equity. We use variation in access to two tax relief programs for individual equity investors in the UK as a source of exogenous variation in the cost of equity for entrepreneurial firms. We examine young, small firms that were covered by a tax relief program launched in 2012, and also slightly bigger firms that did not qualify for this new program. Comparing the trends in investment of these two groups of firms, we show that the sensitivity of entrepreneurial investment to the cost of equity is substantial. In contrast, we find no such evidence for medium-sized firms that by way of a policy change became eligible to a similar tax relief program also during 2012. 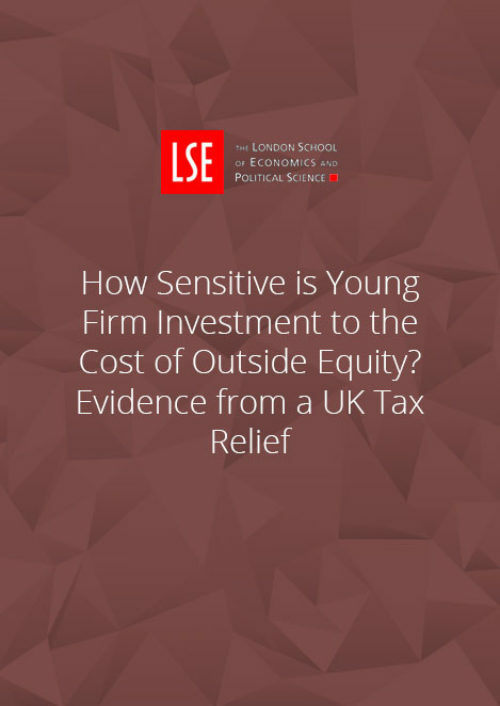 We conclude that many of the small, young firms appear to have been equity constrained.